This house was demolished in 1965. 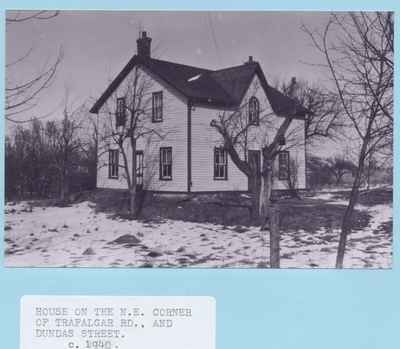 Post's Corners was one of the first hamlets in the area known as Trafalgar Township. It was located at the intersection of what is now Trafalgar Road and Dundas Street, Oakville, Ontario. Later, the hamlet was known as Postville. For more information on the 7th Line and Trafalgar Road village, see the link here to the "Early Ward 5 History" by the Trafalgar Township Historical Society. House on the n.e. corner of Trafalgar Rd. and Dundas St., c.1940.